Mulch Madness - THANK YOU LEXINGTON!!! 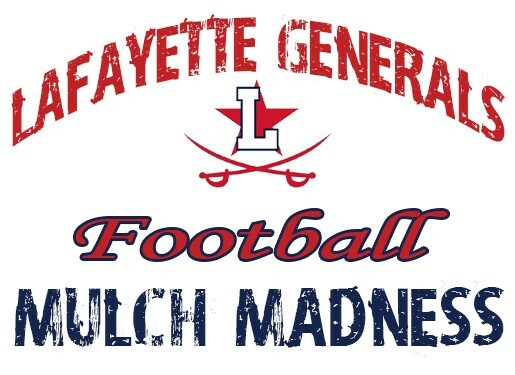 Updated Tuesday April 9, 2019 by LAFAYETTE GENERALS FOOTBALL. THANK YOU LEXINGTON and SURROUNDING COMMUNITIES!!!!!! That's a wrap...we are no longer taking orders for mulch. Your overwhelming response and support of Lafayette Football has made our mulch fundraiser a HUGE success! If you were not able to place your order or get on our delivery schedule this year, please consider us for next spring 2020. Thank you again for supporting the Lafayette Generals Football Team! External links are provided for reference purposes. Lafayette Generals Football is not responsible for the content of external Internet sites. Copyright Lafayette Generals Football All rights Reserved.